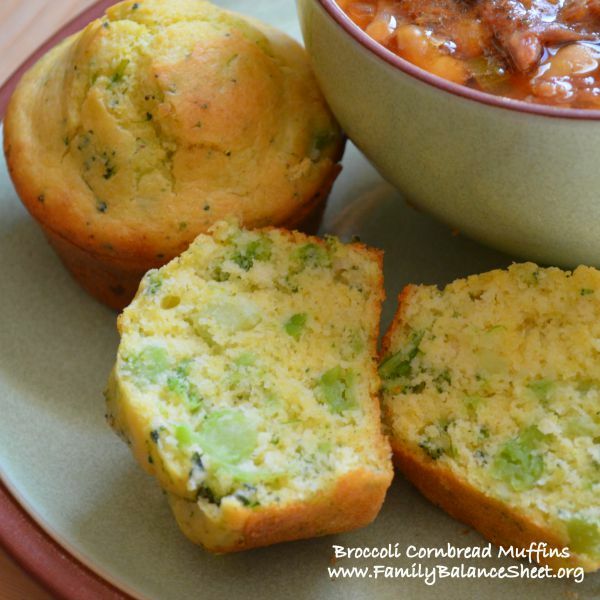 Broccoli Cornbread Muffins make a great accompaniment to any meal, but are my favorite choice for Soup and Salad night. I make a loaf of artisan bread a fair amount of the time, but when we want some variety, I like to serve these muffins. Broccoli Cornbread Muffins go well with any hearty soup recipe or just warmed up in the microwave and slathered with butter for a snack. ½ cup canola oil – I used olive oil, because I was out of canola. Olive oil works if you don’t mind its strong flavor in baked goods. 2. Combine the cornmeal, flour, baking powder, and salt in a small bowl. Set aside. 3. Mix together the sour cream, milk, oil, and eggs. Add the dry ingredients and mix well to combine. Fold in the broccoli. 4. Coat a 12-muffin pan with cooking spray. Pour the batter into the muffin pan. Bake for 15-20 minutes. I love muffins a lot. Have tried several times to make some like this but can’t do it perfectly. Maybe I will also try it this weekend. Thanks!